Have you ever been tempted to snag something from your boyfriend/husband’s closet? Here are the results of my recent treasure hunt – along with a few tricks I learned for pulling off the look. Now before you assume that this is my husband’s workplace, I should make a disclaimer. Mark isn’t even a big fix-it guy. But I had a recent appointment at this mechanic shop. And so, I took advantage of it to capture the perfectly manly backdrop. Okay, I’m stereotyping! Now about those tricks to avoid appearing utterly hideous or ridiculous in my husband’s shirt (I hope!). First of all, one of the best ways to achieve a flattering look with a baggy man’s shirt is to pair it with skinny jeans. When my top half is swimming in fabric, the last thing I need is anything that visually, adds width to my lower half. Another trick that worked for me was to balance out the masculine elements – the shirt – with a few sexier details. 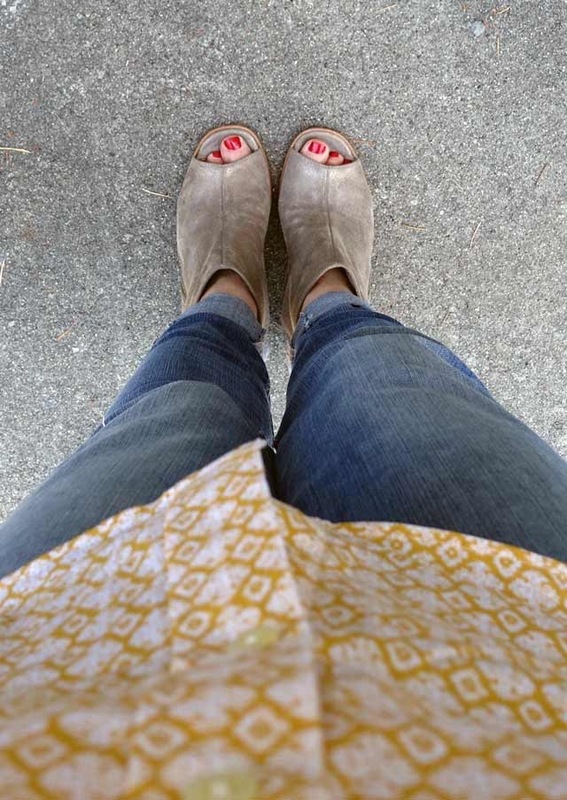 I wore rolled-up jeans to expose my (lily-white) ankles. And for my footwear, I chose metallic open-toed booties which show off my pedicure. 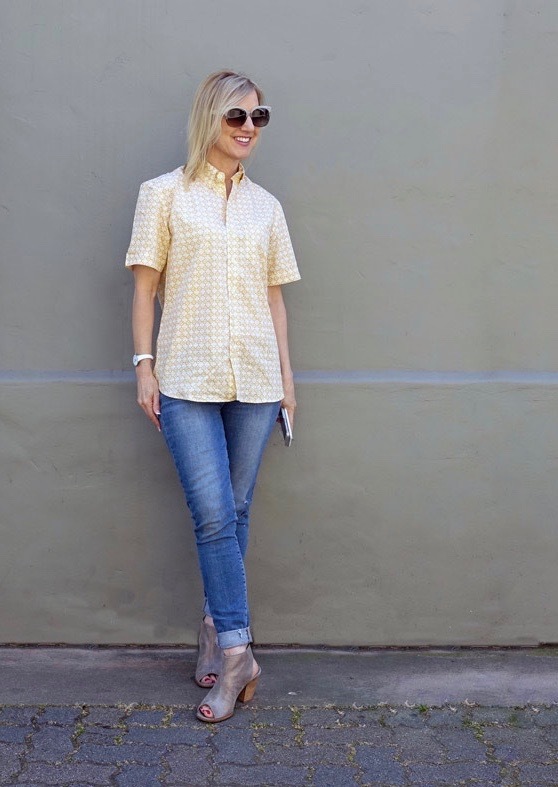 Since I am a girly-girl at heart, I also chose the most gender-neutral shirt my husband owns – one with a lovely yellow and white pattern. It’s funny; I never thought I’d wear anything yellow next to my face. I wrote the color off as being totally unflattering. But after appropriating this from my sweetie’s closet, I’ve discovered that I might be able to pull off yellow after all…sort of. By the way, I was astonished that wearing a shirt that hits the widest part of my body (my hips) didn’t totally ruin my silhouette. I attribute that to the way the shirt balances my lower half with the illusion of extra wide shoulders. The heels of my booties also lengthen my legs. Hope you liked this look. Do you ever wear any of your sweetie’s clothes? Ha ha, you’re looking good in your hubby’s shirt! But if I tried that it would look ridiculous! I can wear his tee as a mini dress! My hubby is two meters tall! Thanks, Nancy! I would love to see you styling your hubby’s tee as a mini dress! 😀 Have a great weekend! This is such an easy-going look and no need to be afraid of wearing yellow as it suits you! Unfortunately, my husband’s shirts can’t fit me! Such a lovely outfit!! So comfy and chic! You wear your husband’s shirt well; lovely bright colour for the summertime too! Gorgeous red pedicure, by the way! That is so cool! I never would’ve guessed that is your hubby’s shirt! 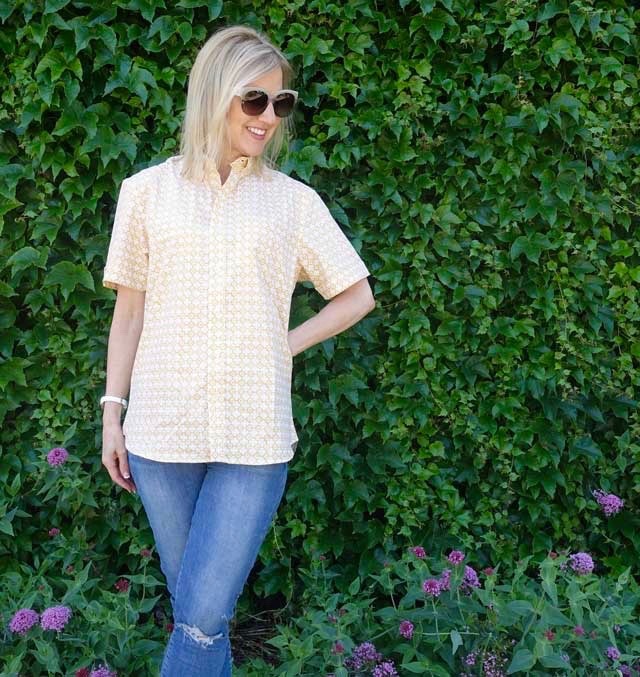 Such a cool way to wear a man’s shirt, you look super stylish Janea! You look fabulous in your hubby’s shirt. Enjoy the rest of the week darling! I’m guilty as charged, hehe! I love wearing my husband’s clothes, especially his graphic t-shirts from Zara with a pair of leggings as loungewear; so comfy too! You’ve pulled this look off very nicely! I love raiding my boyfriend’s closet for stuff- you look so cute here, babe!